Lindsay Lohan plump collagen lips at court appearance. 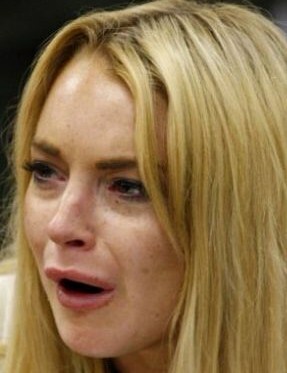 Did you happen to catch a glimpse of Lindsay Lohan's extra plump and freshly injected lips while in court this week. We've highlighted the ever changing shape of Lindsay Lohan's lips in the past, and it looks like she is still up to her old tricks. Perhaps this 90 day jail sentence will be the long overdue wake up call this poor girl desperately needs. Lindsay Lohan lips close up. Lindsay Lohan lips side view.